Writing an analytical essay is usually complicated task for students. Sometimes it becomes even backbreaking work. This typical type of assignments involves breaking up the subject of the research into smaller subcategories in order to analyze each of them and create a single comprehensive analysis of the phenomenon under study. Such type of essay is a way to know and comprehend various complex multicomponent phenomena. Having a notion of the basic rules for writing an analytical essay will save students from making common mistakes that ultimately affect their academic performance. There are basic rules for writing an essay, following which you will write a qualitative analytical essay quickly and without difficulties. Choose an interesting topic for you. It is important to choose for analysis that phenomenon or question which is already familiar to the author. Further analysis will help the student just look at the analyzed question from a different angle, developing his thinking, imagination and analytical skills. All this is the crux of the matter of writing analytical essays. You should write an essay on a controversial topic, about problems unknown to others. Therefore, your analytical essay will be interesting, reasoned and innovative. Reflecting on the phenomenon under investigation, it is necessary to ask yourself all sorts of questions that will help analyze the topic more deeply. “What happened? How did it happen? For what purpose? What could be the consequences? ”- are the best questions for analysis. The typical error can be attributed to the insufficient study of the analyzed question. It is important to remember that in addition to the structure of the material or summarizing, it is necessary to investigate the problems comprehensively and to break the question down into its constituent components. Then each of the components should be intently studied that it is possible to make a full conclusion on each unit. The key to success of any essay, including an analytical one, is a well-written outline. Such a plan will make your essay structured and help you control if all the components have been investigated comprehensively. Each component of the studied subject should be assigned a separate paragraph, which not only structures the essay, but also helps to easily supplement and expand already existing data. It is well worth to start with the most important ones, smoothly moving from them to less important arguments. A brief and at the same time informative thesis will clearly demonstrate basic idea of your analytical essay to the readers. Usually a good thesis is one or two sentences that clearly show the readers your position regarding the object under study. Having more than one analysis argument, supported by relevant examples, will make your essay reasoned and convincing. Examples should be selected clear to the reader and clearly demonstrating the stated argument. Suitably matched quotes will excellent play in your favor, making your analytical essay stronger. Be sure to pay much attention to the formation of citation. It is important to make a clear and concise conclusion when all the arguments are illustrated by means of examples. In this part you need to repeat the main points of your presentation, the key phrases that should remain in the minds of your readers. Thus, adhering to all the basic rules of writing the analytical essay mentioned above, you can successfully analyze one or another object. However, it is worth remembering that, nevertheless, this task is not an easy one and requires certain abilities of knowledge and practice. 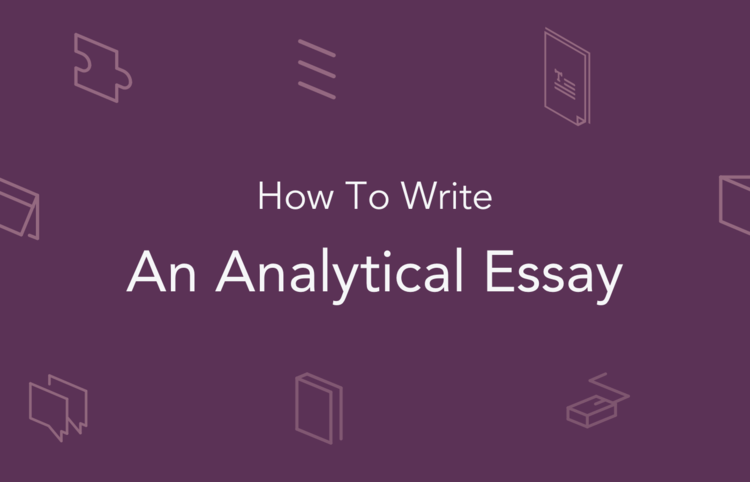 If you still do not have enough skills to write a proper analytical essay – don’t worry! In this case, special services, such as pro-papers.com/buy-analytical-essay will give a helping hand you. They will easily help out with high-quality analytical essay in quick terms without compromising your academic achievements!